Traveling east in the alley between 12th and 13th Ave. The intersection is Alder St. 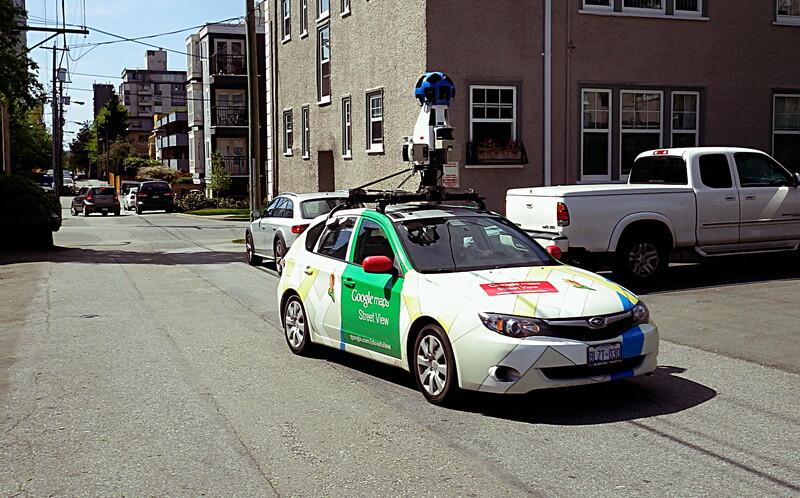 The little car heads east towards Oak St.
I’ve never seen a Google Maps Street View car up close before but I still recognized one when it zipped by me yesterday morning on West Broadway Avenue. I was hoping for a second chance and a better look. Today I got my chance in the lane between 12th and 13th Avenue. 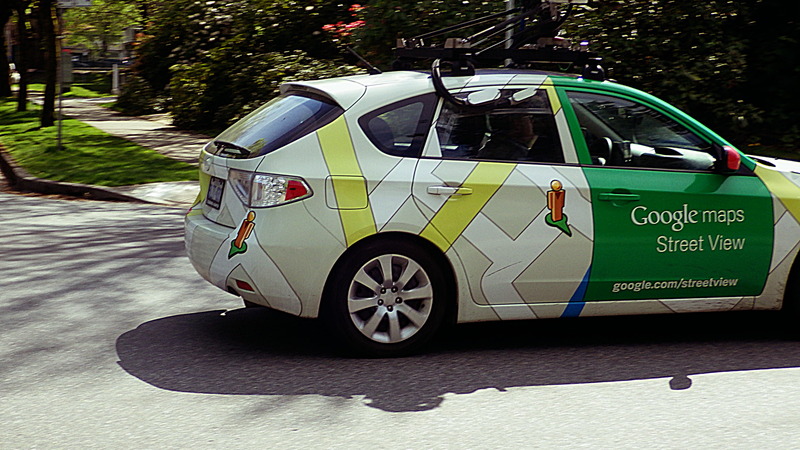 The Google Street View car traveled no faster or slower than any other car. The ad-wrap on the car branded it for what it was but aside from the green doors the design wasn’t very visible even a short distance a way. The car was a generic-looking Subaru Impreza bearing Ontario license plates. The license plate holders were monogrammed, “Subaru Brampton,” suggesting Google bought the car from a Subaru dealer in beautiful Brampton, Ontario, once known, according to Wikipedia, as “The Flower Town of Canada” but not lately. 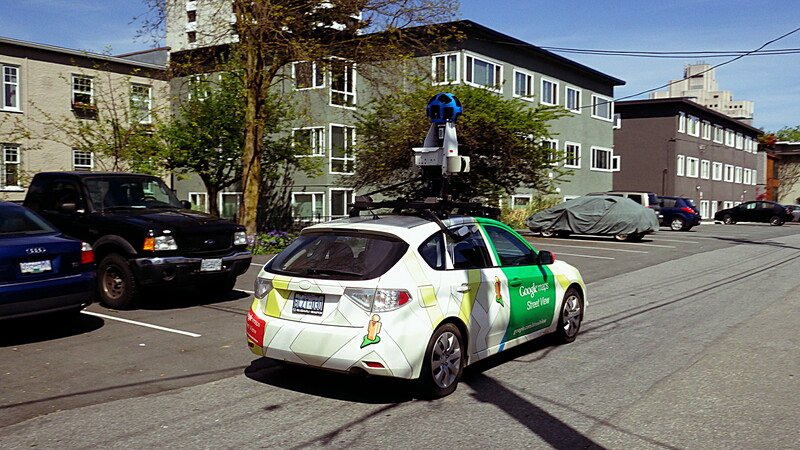 Of course, what distinguishes it as a Google Maps Street View car — even a block away — is the camera mast on the roof, topped with a vaguely soccer-ball-like arrangement of camera lenses. It turned on Oak St. and here it is at 13th Ave. and Spruce St. traveling west. A piece in the Daily Mail perhaps explains why my Street View car idled at the intersection of 13th Avenue and Spruce Street for so long — it may have been waiting for me to get the fu*k out of the shot. Apparently the drivers are supposed to avoid getting people in the shot if possible. Which is funny given what they’ve captured over the years. Click the images to enlarge them. 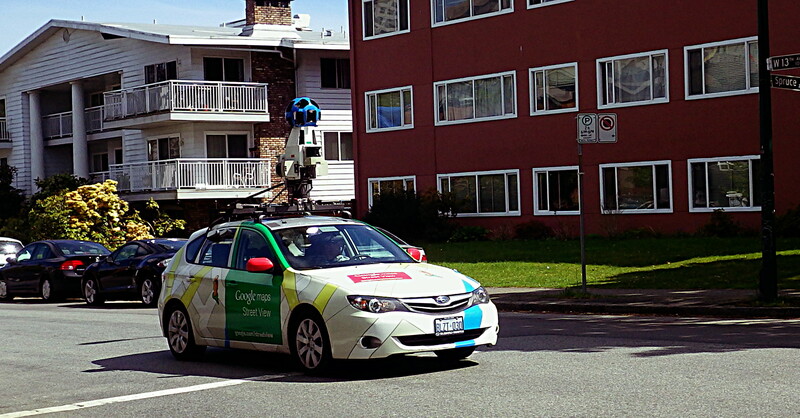 Bye bye Google Maps Street View car. This is a lovely comment. Well worth running through an online translator for those of us who are not lucky enough to be fluent in Portuguese. Thank you.